Introduction: Landslides are one of the critical natural processes, which cause enormous damage to life and property..Uttarakhand Himalaya is vital to sustainity of region. This region is very fragile due to topographic and climatic condition. Landslides in the mountainous terrains are natural derivational processes and one of the most. 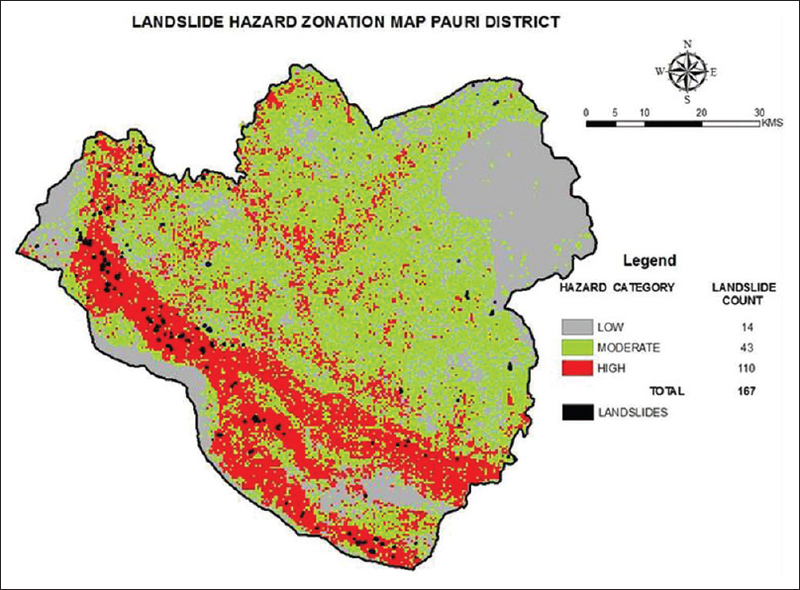 There is a need for Landslide Hazard Zonation for identification of potential landslide areas. Keeping this in mind one hilly district, Pauri district of Uttarakhand, India was selected. 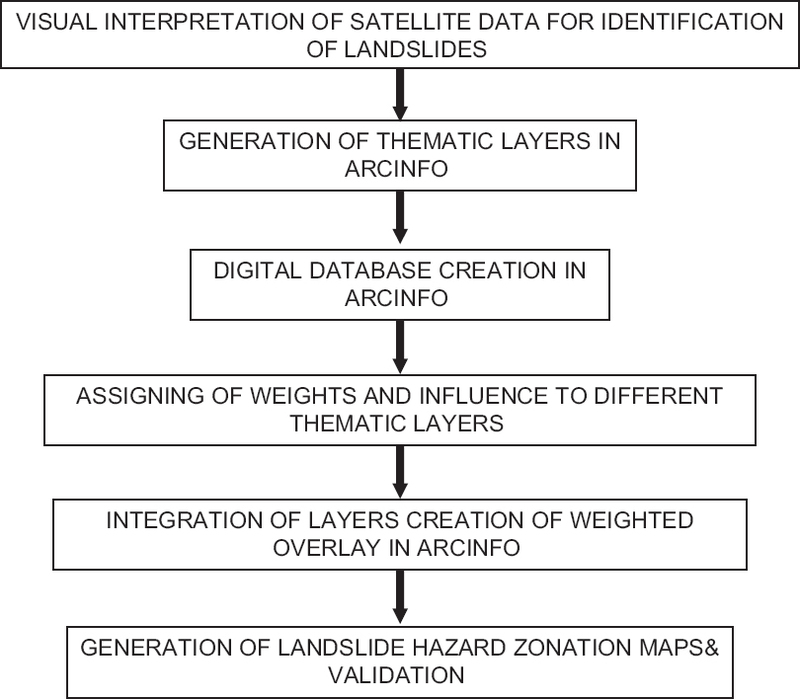 Materials and Methods: The present study is an attempt towards development of a landslide model by using multi-criteria decision analysis in GIS and remote sensing techniques for landslide hazard zonation. The IRS LISS-4 satellite imageries, Survey of India topographical maps, and ancillary data were used as inputs to the study. The data layers of land use–land cover and geology were interpreted from satellite image and available ancillary data. Other raster thematic layers, i.e., slope, aspect, elevation, and drainage density, have been generated in Arc info three-dimensional analyst tool using ASTER DEM of 30 m resolution. A numerical rating scheme for the factors was developed for spatial data analysis in GIS. Results and Decision: Using high-resolution LISS-IV and Cartosat-2A, merged data of 2011–2012 landslides were mapped by visual interpretation of satellite image. A total of 167 landslides have been identified. 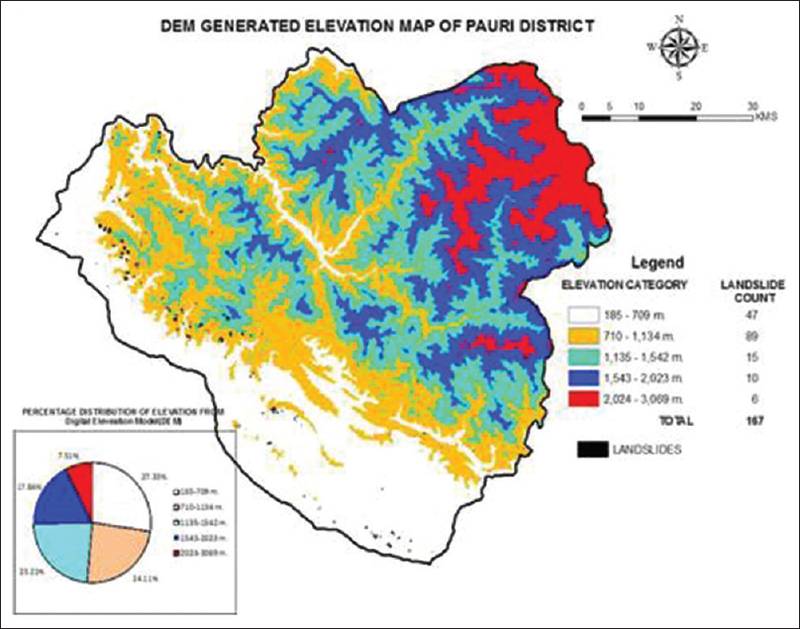 Elevation map of Pauri district was prepared by classifying digital elevation model into 5 elevation categories. Distribution of landslides in different elevation categories is also done. Maximum landslides have occurred in elevation category (710–1134 m) and (185–709 m). Slope map has been generated and classifi ed into 6 slope classes, i.e. 0°–5°, 5°–10°, 10°–20°, 20°–30°, 30°–40°, and more than 40°. Distribution of landslides in different slope categories is also done. Maximum landslides have occurred in slopecategories (10°–20°), (20°–30°), and (30°–40°). Aspect map has been generated and classified into 8 aspect classes. Maximum landslides have occurred in aspect categories South-West (14.37%), South (35.97%), and South East (15.57%) directions. The Southern aspect (SW-S-SE) contributes to 65.91% of total landslides. Drainage density map has been generated from ASTER DEM using three-dimensional Analyst tool and classified into 6 classes, namely 0–2, 2–4, 4–6, 6–8, and more than 8 (km/sq.km). 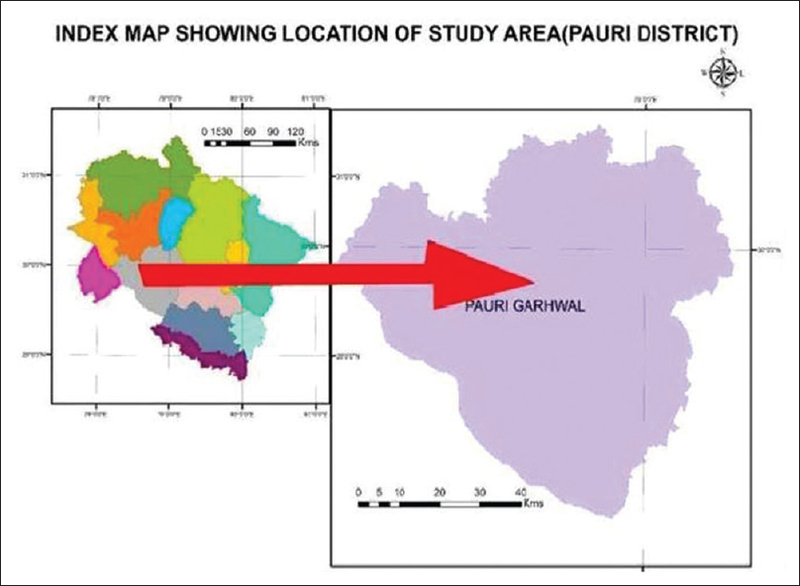 Geological map of Pauri district has been adopted from Geological map from Geological SOI. Rock types such as phyllites, quartzites, slates, siltstone, sandstones, graywacks, granitoids, alluvium, crystallines and metamorphics, and limestones are present in the district. Distribution of landslides in different drainage density categories is also done. Maximum landslides have occurred in drainage density category 2–4, 4–6, and 6–8 (km/sq.km). 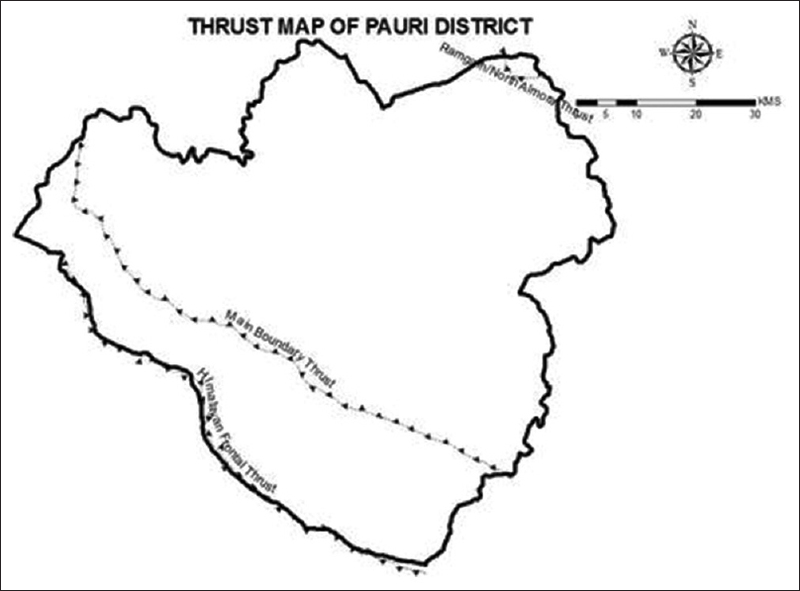 LULC map of Pauri was classified into various classes such as water body, forest scrub, wasteland/scrub, tree-clad, forest evergreen, agriculture land, built up, forest deciduous open, and forest deciduous dense/close. Maximum landslides have occurred in forest deciduous open category (84) followed by agriculture land (22), forest scrub (14), forest evergreen and forest deciduous dense/close (13 each), and water body. Conclusion: The above-mentioned 6 layers were integrated in the weighted overlay model of Arc Info and weights were assigned corresponding to landslide occurrence in these layers. The influence of the layer in causing landslide has also assigned. The final LHZ map generated after processing 6 themes. The final map has been classified into 3 categories, namely high, moderate, and low hazard categories. Of a total of 167 landslides, 110Landslides fall in the high HZ and 43 landslides fall in moderate HZ category while only 14 landslides fall in the low HZ category. 34.01% of the district falls under low HZ category and 40.73% falls under moderate HZ category while 25.26 under high HZ category. More layers need to be added in the model to obtain more precision. This map is not checked in the fi eld ground truth. Landslide, one of the natural catastrophes, always causes a major problem in the Himalayas by killing hundreds of people every year besides damaging the properties and blocking the communication links. Landslides in the mountainous terrains are natural derivational processes and one of the most important landscape building factors. Most of the terrains in the mountainous areas have been subjected to slope failure at least one under the influence of a variety of factors and triggered by event such as extreme rainfall or earthquakes. The frequency and magnitude of slope failures can increase due to human activities, such as deforestation or urban expansion. The problem of landslides becomes more aggravated, especially during the rainy season leading to unstability and deformation in landmass. As such, there is an urgent need on part of the scientific community to formulate strategies for minimizing the societal impact of landslides. One of the first steps in this direction is preparation of landslide hazard zonation (LHZ) maps. The possibility and frequency of occurrence of landslides along any slope are, however, dependent on the geological characteristics of its constituent materials. According to Brabb, at least 90% of landslide losses can be avoided if the problem is recognized before the event. Hence, there is a dire need for landslide hazard assessment at various spatial scales. The application of remote sensing (RS) and geographic information system (GIS) provides several useful input variables such as slope, aspect, and elevation-marked zonation for integration of various datasets for the quantitative approaches of the work. Keeping this in view, the present study is to operationalize a working methodology wherein a geoenvironmental parameters are analyzed to develop models for mapping landslide prone areas using remotely sensed data and geographical information system (GIS). The present study shows the delineation of landslides using high-resolution satellite data and the relationship between landslides and selected terrain parameters from the study area used for the preparation of LHZ. based on integration of remotely sensed data–derived layers and terrain characteristic–derived topographic data. Pauri district lies between longitudes 78° 11' 30'' E and 79° 14' 20'' E and latitudes 29° 26' 45''N and 30° 14' 42''N. Pauri district forms boundaries with Dehradun and Haridwar in West; Tehri, Rudraprayag, and Chamoli in North; Naintal and Almora in East; and Bijnor (U.P.) in South [Figure 2]. The district is administratively divided into 9 tehsils, namely Pauri, Lansdown, Kotdwar, Thalisain, Dhumakot, Srinagar, Satpuli, Chaubatakhal, and Yamkeshwar and 15 developmental blocks, namely Bironkhal, Dwarikhal, Dugadda, Ekeshwer, Jaihrikhal, Kaljikhal, Khirsu, Kot, Nainidanda, Pauri, Pabo, Pokhra, Rikhnikhal, Thalisain, and Yamkeswar. The area of Pauri district is 5230 sq.km. The population is 687,271 which are distributed in 3473 villages. Based on the objectives and information needs, spatial data consisting of thematic maps form remotely sensed data and other/conventional sources have been prepared. GIS Package ARC/INFO (ARC GIS 10.2.2) package has been used as the core of the spatial database. The ARC/INFO has various modules and some of them have been extensively used in the present study. The spatial data domain forms a set of layers prepared from Remote Sensing, GIS and from Survey of India (SOI) topographic sheets. Longitude and latitude coordinate systems depicted on SOI topographical maps have been used for georeferencing the satellite and other ancillary data. The scale for input data is 1:50000. The satellite data of the study area have been geo-referenced using the standard coordinate system of the topographic maps using image processing software. The georeferenced satellite data are opened in the Arc GIS 10 Arcview, and visual interpretation techniques were used to demarcate the existing landslides. The standard image interpretation keys such as tone, color, texture, and association were used. In total, 167 landslides have been marked. These landslides were converted to KMZ files and overlaid on the Google Earth software. The locations were verified in the 3 dimensions and checked from all the angles. Thematic layers were generated by visual interpretation of the satellite image [Table 1] and [Figure 1]. Using high-resolution LISS-IV and Cartosat-2A, merged data of 2011–2012 landslides were mapped by visual interpretation of satellite image. 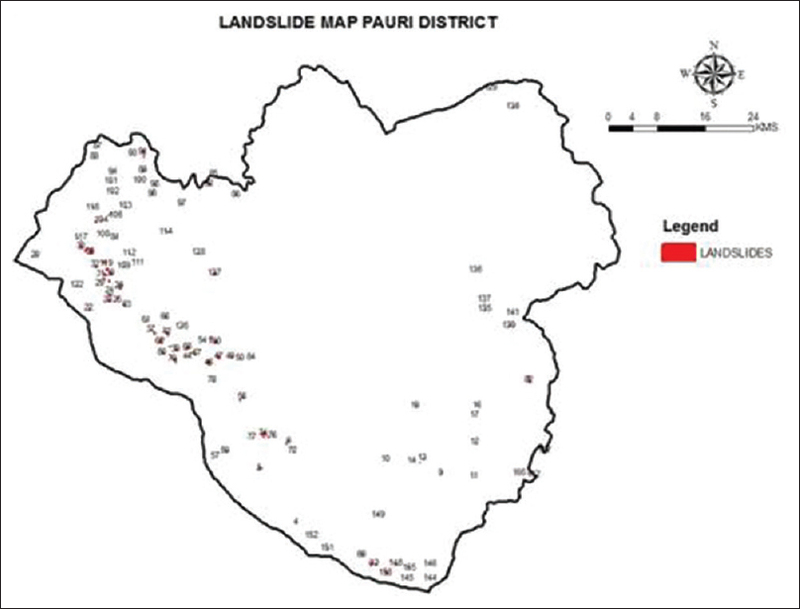 A total of 167 landslides have been identified [Figure 3]. 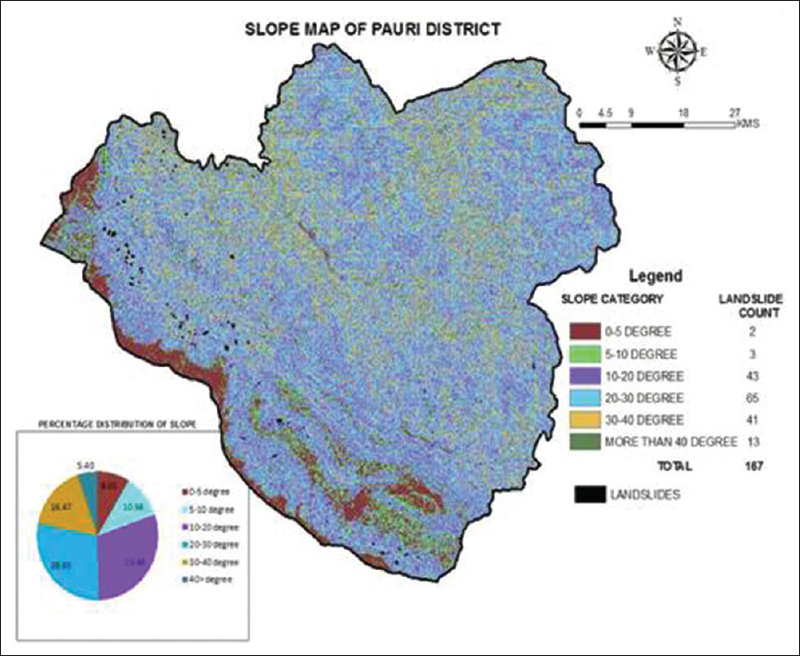 Elevation map of Pauri district was prepared by classifying digital elevation model into 5 elevation categories [Figure 4]. Distribution of landslides in different elevation categories is also done. Maximum landslides have occurred in elevation category (710–1134 m) and (185–709 m). Slope is a very important factor in determining the slope stability. Slope map has been generated and classified into 6 slope classes, i.e. 0°–5°, 5°–10°, 10°–20°, 20°–30°, 30°–40°, and more than 40° [Figure 5]. Distribution of landslides in different slope categories is also done. Maximum landslides have occurred in slope categories (10°–20°), (20°–30°), and (30°–40°). Aspect map has been generated and classified into 8 aspect classes [Figure 6]. Distribution of landslides in different slope categories is also done. Maximum landslides have occurred in aspect categories South-West (14.37%), South (35.97%), and South East (15.57%) directions. 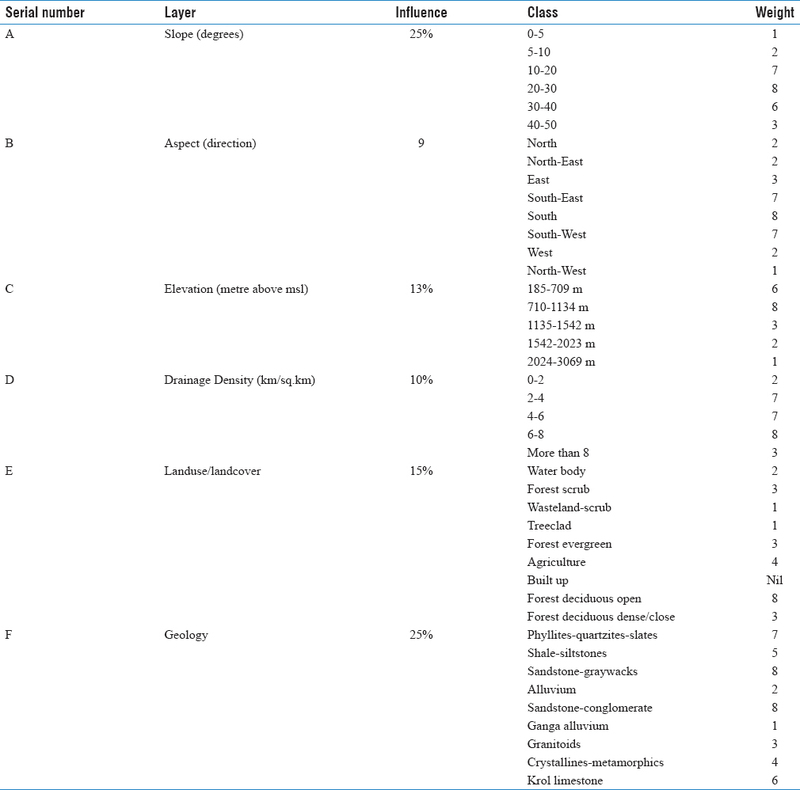 The Southern aspect (SW-S-SE) contributes to 65.91% of total landslides [Table 2]. Lithology plays a very important role in the occurrence of landslides. Interaction between local geology and the long-term climatic conditions results in significantly different landforms with varying degree of susceptibility to land sliding. 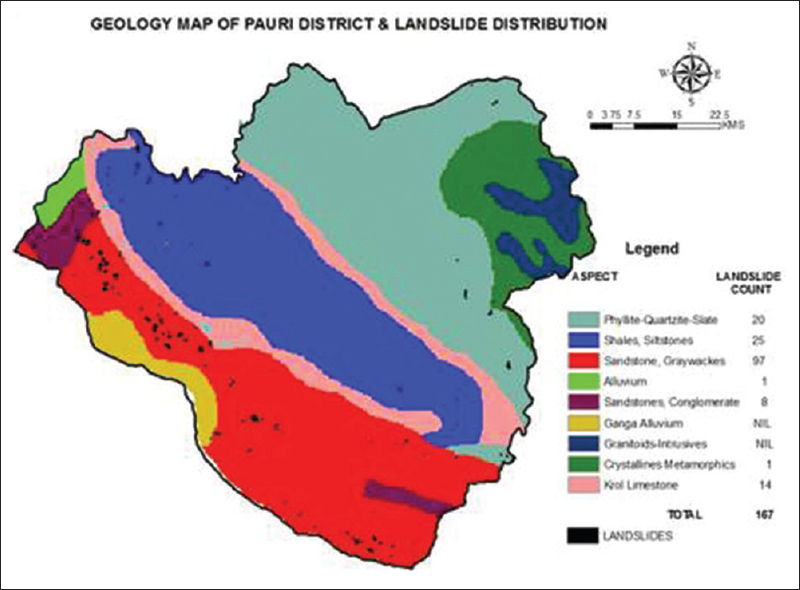 Geological map of Pauri district has been adopted from Geological map from Geological SOI [Figure 7] and [Figure 8]. Rock types such as phyllites, quartzites, slates, siltstone, sandstones, graywacks, granitoids, alluvium, crystallines and metamorphics, and limestones are present in the district. Maximum landslides have occurred in Sandstone-Graywacks category (Siwalik formation). The area is also traversed Himalayan Frontal Thrust, Main Boundary Thrust, and Ramgarh/North Almora Thrust. 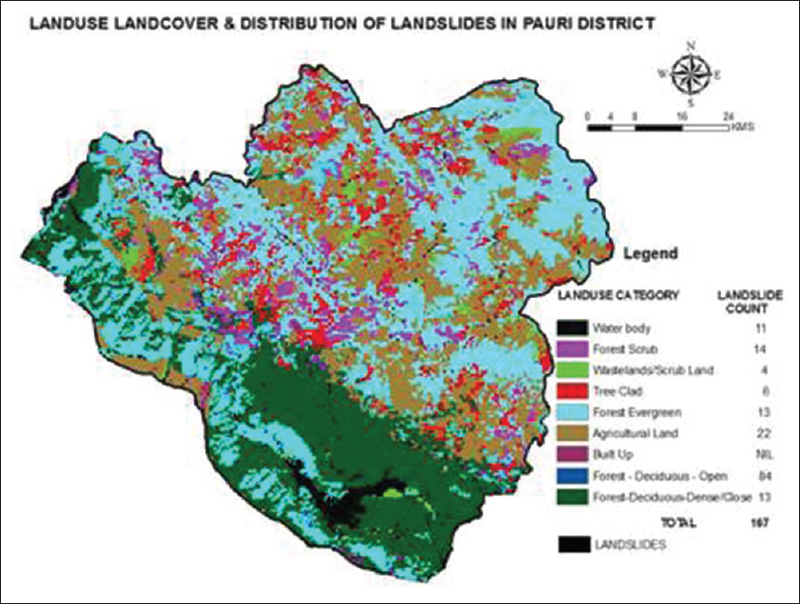 LULC map of Pauri was classified into various classes such as water body, forest scrub, wasteland/scrub, tree-clad, forest evergreen, agriculture land, built up, forest deciduous open, and forest deciduous dense/close [Figure 9]. Maximum landslides have occurred in forest deciduous open category (84) followed by agriculture land (22), forest scrub (14), forest evergreen and forest deciduous dense/close (13 each), and water body (11). The above-mentioned 6 layers were integrated in the weighted overlay model of Arc Info and weights were assigned corresponding to landslide occurrence in these layers. The influence of the layer in causing landslide has also assigned. The details are shown in [Table 3]. Drainage density map Drainage density is the total length of all the streams and rivers divided by the total area of the drainage basin. It is a measure of how well or how poorly a watershed is drained by stream channels. It is also directly proportional to the magnitude of erosion, thus affecting the incidences of landslides. Its unit is km/sq.km. Drainage density [Figure 10] map has been generated from ASTER DEM using three-dimensional Analyst tool and classified into 6 classes, namely 0–2, 2–4, 4–6, 6–8, and more than 8 (km/sq.km). 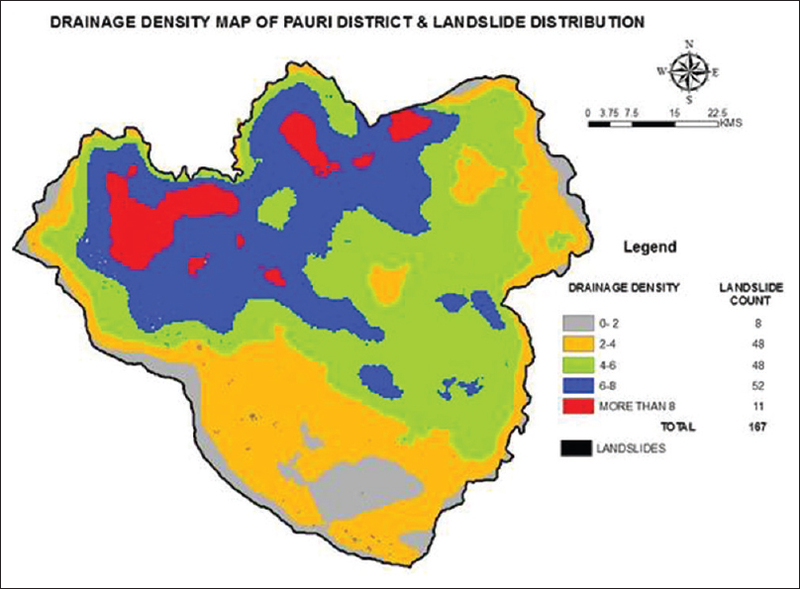 Distribution of landslides in different drainage density categories is also done. Maximum landslides have occurred in drainage density category 2–4, 4–6, and 6–8 (km/sq.km)[Figure 10]. The final LHZ map generated after processing 6 themes in Arc Info is shown in [Table 4]. The final map has been classified into 3 categories, namely high, moderate, and low hazard categories [Figure 11]. The present study brings out a definite relationship between the landslide occurrence and the RS generated thematic layers. The LHZ is categorized into three categories: high, moderate, and low hazard zones. Of a total of 167 landslides, 110. Landslides fall in the high HZ and 43 landslides fall in moderate HZ category while only 14 landslides fall in the low HZ category. 34.01% of the district falls under low HZ category and 40.73% falls under moderate HZ category while 25.26 under high HZ category. More layers need to be added in the model to obtain more precision. This map is not checked in the field ground truth. Negi IS, Kumar K, Kathait A, Prasad PS. Cost assessment of losses due to recent reactivation of Kaliasaur landslide on National Highway 58 in Garhwal Himalaya. Nat Hazards 2013;68:901-14. Yin KL, Yan TZ. Statistical prediction model for slope instability of metamorphosed rocks. In: Proceedings of the 5th International Symposium on Landslides. Lausanne, Switzerland 1988;2:1269-72. Cruden DM, Varnes DJ. Landslides: Investigation and Mitigation. Ch. 3. Landslide Types and Processes. Transportation Research Board Special Report, 247; 1996. Anbalagan R. Landslide hazard evaluation and zonation mapping in mountainous terrain. Eng Geol 1992;32:269-77. Thapa PB, Dhital MR. 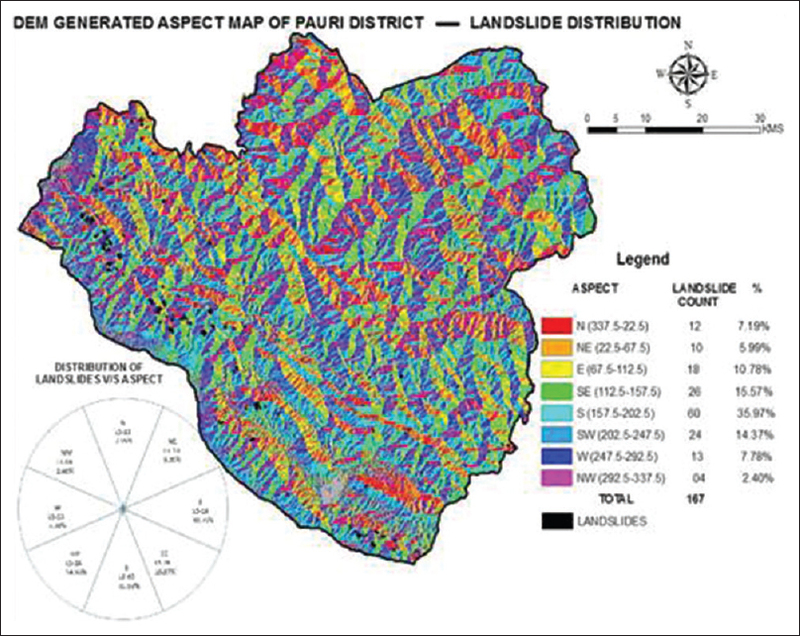 Landslide and debris flows of 19-21 July 1993 in the Agra Khola watershed of central Nepal. J Nepal Geol Soc 2000;21:5-20. Brabb EE. Priorities for landslide during the international decade of hazard reduction. In: Landslides: Seventh International Conference and Field Workshop 1993. p. 7-14. Jaiswal P. Landslide Probability and Risk Quantification along Communication Corridors from Historical Records: A Case Study from Nilgiri Hills. Tamil Nadu, India, PhD Research Proposal, ITC, Enschade; 2007. p. 11. Dahal RK, Hasegawa S. Representative rainfall thresholds for landslides in the Nepal Himalaya. Geomorphology 2008;100:429-43.